Аn extension grant has been accepted! With a letter dated Dec 27,2012 the Ministry informed Peter Koltermann that the application for an extension grant has been accepted. Congratulations to all, and looking forward for more challenging work. 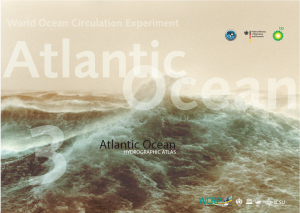 NRAL received the printed versions of the WOCE Atlantic Atlas. Talley, 2007, 2012). The distribution will start soon. The Atlas is also available here. NRAL Conference was held on December, 14 at the Congress-park «Volynskoe». NRAL Conference «Natural risk assessment in the coastal zone» was held on December, 14 at the Congress-park «Volynskoe». All working groups presented their results in the project. The participants discussed problems and opening questions at the end of the project. Peter Koltermann and Sergey Dobrolyubov introduced the new proposal for 2013-2014. NRAL has summarized its two years of work and achievements in a brochure. Much progress has been made, and new scientific knowledge increases our understanding of natural hazards, their threat and their interaction with society. The brochure also provides a glimpse into the future we plan, subject to the results of the present round of grant extensions. A database of the floods in river mouths of European part of Russia was created. A database of the floods in river mouths of European part of Russia was created by members of NRAL (hydrologists). It contains a lot of information, often unpublished and scattered, about floods in the lower reaches and river’s estuaries, parameters of floods, factors causing them, hazardous hydrological events of social, economic and environmental damage, which associated with floods. It also contains information about rivers and monitoring network in the river mouths and near the sea. Database consists of five sections and subsections, each of the blocks of information allows to solve a wide range of scientific, engineering and management problems. Description of the database is here. NRAL expedition to Gelendzhik (Krasnodar region) to assess the impacts of extreme floods, which occurred July 6, 2012 was held during August 11-20 2012. The participants were members of the creative team of the laboratory: Sergey Mukhametov, Stanislav Myslenkov, Timofey Samsonov. and Ksenia Silvestrova. The objective of the expedition was to conduct topographic surveys in the valleyof Yashamba river and adjacent coastal areas (lengthwise and transversal valley profiles, flooding marks, survey of mouth), and bathymetric survey of BlueBay. During the work, geodetic measurements were also made ​​in the South Branch of the P.P.Shirshov Institute of Oceanology to facilitate reconstruction of local infrastructure. The surveys were directed to detailed description of topography changes that occurred during the flood on July 6. Additional information was acquired by polling local inhabitants and taking photos of the buildings inside the flood area. Collected data will be used in the reconstruction of the maximum level of the river to simulate water flow, sediment load and damage to the local population. 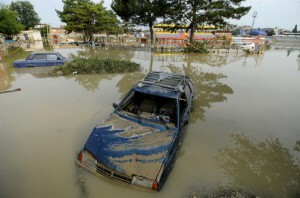 It is hardest hit as heavy rains occurred late Friday night into Saturday morning (July 6-7, 2012). 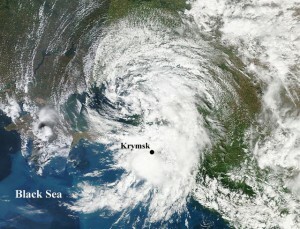 Heavy rain and massive flash flooding occurred in Krymsk and in the Black Sea port of Novorossiysk and Gelendzhik. 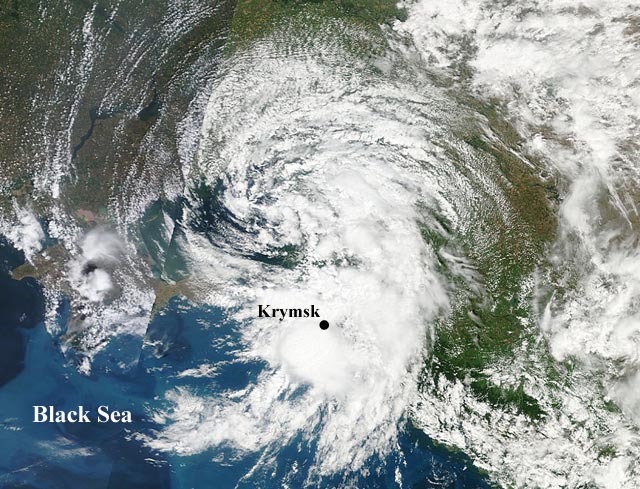 The main reason of flood was the low pressure system that had moved westward over the preceding days gathering strength from the warm Black Sea. According to our measurements at the stations, the rainfall in less than a day was characterized by the following numbers: in Gelendzhik there was 300 mm, in Novorossiysk there was 300 mm, near Krymsk there was 170 mm, and at a small distance from it, in Dzhubga and Anapa, there was only 6-18 mm. This is a local, explosive and very intense process. More than 170 people died and 35,000 were injured or lost their property.